Having a surgical procedure is always stressful. Having Pulmonary Arterial Hypertension and needing a surgery is even more stressful. Over the years, centers of excellence in PAH care have figured out ways to minimize the risk. Below I outline some of the important areas to consider when planning for a surgery or invasive procedure. 1. Is the procedure necessary? The best way to avoid harm is to avoid unnecessary procedures. For example, if your cardiologist wants you to have a trans-esophageal echocardiogram (ultrasound exam of your heart from the inside of your esophagus) there are alternatives that do not require sedation and are not invasive. Don’t be shy. Always feel comfortable asking about alternatives to the procedure. Don’t be afraid to ask what are the risks of choosing not to undergo an invasive procedure. 2. Where is the procedure going to take place? In the world of medicine, procedures can take place in a doctor’s office, in outpatient surgical centers (surgi-centers) or within a hospital. In general, procedures that do not require any sedation can be performed in any setting. Procedures that require any sedation should not be undertaken in the doctor’s office or in outpatient procedural/surgical centers. The safest place to perform a procedure that requires sedation is in a hospital that has a full complement of PAH capabilities including a PAH expert. 3. Does the procedure require sedation or anesthesia? There are several different levels of sedation for invasive procedures. The lightest sedation carries less risk and requires less monitoring. However, any PAH patient that is to receive any sedation needs a continuous oxygen saturation monitor, blood pressure monitoring and a designated staff member to monitor breathing. Moderate sedation involves more risk and requires an anesthesiologist to be present for PAH patients. This is the type of sedation that is used for colonoscopy. Moderate sedation should only be performed inside a hospital with expert PAH capabilities. There are different medicines that may be used to achieve moderate sedation. I generally avoid propofol due to the risk of lowering your blood pressure and depressing your breathing. Versed and fentanyl are much safer. The deepest level of conscious sedation is called deep sedation and should only be undertaken by an anesthesiologist with skill and training in managing pulmonary hypertension patients. This type of sedation requires more monitoring such as an arterial line to measure your blood pressure continuously. Deep sedation should only be done in a hospital with expert PAH capabilities. Lastly, general anesthesia is the deepest level of sedation. When you are under general anesthesia, you are completely unconscious and not breathing on your own. You will have a breathing tube and be on a breathing machine. This type of anesthesia carries the highest risk for PAH patients and requires an anesthesiologist with special skill and training in the care of PAH patients (typically a cardiac anesthesiologist). I always have an arterial line in place and sometimes a central venous catheter (big IV catheter in the neck). 4. Who will be delivering the sedation? 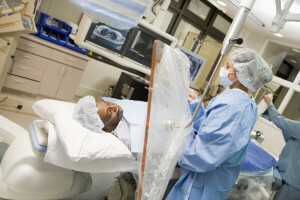 Anesthesiologists are doctors that specialize in delivering the sedation and putting patients to sleep for procedures. Within the broader specialty of anesthesia there are subspecialties—such as cardiac anesthesiology. Cardiac anesthesiologists specialize in the sedation of patients with advanced cardiac disease including pulmonary hypertension. 5. What should take place before the procedure? Before I give the green light for my patients to proceed with an invasive procedure, I see the patient in the office and review how they are doing. I pay particular attention to any signs of heart failure such as fluid retention. If the planned procedure involves deep sedation or general anesthesia then I often plan a right heart catheterization prior to granting permission for the procedure to proceed. This allows me to make sure that my patient is doing well enough to tolerate the planned procedure. A thoughtful preoperative visit will include a plan for blood thinners, all PAH medicines and a discussion of how to minimize the risk of blood clots if the patient is to be hospitalized after the procedure. I generally talk with the physician that will be performing the procedure if the procedure will involve general anesthesia or deep sedation. 6. What should take place before larger surgeries? For patients with more advanced PAH who require major surgical procedures I often admit the patient the night before the surgery and place an arterial line and a central venous catheter prior to the surgery. I also prepare the medications that may be needed during the procedure and personally talk with the anesthesiologist. I often will accompany the patient into the operating room and be present for induction of anesthesia (putting the patient to sleep). Having an experienced set of hands to help can minimize risk dramatically. We work hard to avoid excessive fluid administration during surgery and minimize blood loss. Pulmonary artery catheters are not helpful despite what many older anesthesiologists will tell you. Sometimes the right thing to do is to cancel a patient’s surgery. This often creates frustrations for the patient and the surgeon. However, it is always better to have a live patient and a frustrated surgeon than a bad outcome. Good surgeons will understand and appreciate your pulmonary hypertension doctor’s attention to details. 8. Are there medicines to avoid? Depending on how severe the pulmonary hypertension is, we often avoid certain types of anesthesia. It is best to talk in advance with your pulmonary hypertension specialist and your anesthesiologist to make a plan before the procedure. 9. Should I skip my medicines the morning of surgery if I am told to take nothing by mouth? In general we have our patients skip their diuretics but we strongly encourage them to take their other pulmonary hypertension medications in the early morning with a small amount of water. If you are taking Orenitram then you will need to have a very clear plan as missing even a single dose of Orenitram is not advised. If you are on a pump-based therapy (Flolan/Remodulin/Veletri) then you should bring all your supplies and your back up pump. Make sure that you have enough medicine in your pump so that it does not run out. If you are on an inhaled PAH medication, then do your treatments as scheduled. If you are unable to do a treatment on time due to the surgery, then just do the treatment when you are next able.